DETROIT, May 7, 2018 /PRNewswire/ -- DTE Energy (NYSE: DTE) today announced it has entered into an agreement with The Roxbury Group, a Detroit-based real estate development company, to develop an 11-acre mixed use and public space project on the former Michigan Consolidated Gas Company industrial site bordering the Huron River in Ann Arbor, Mich. Located at Broadway Street at the Huron River, the project could bring up to $75 million or more of attractive, community-benefitting investment to this currently vacant site. "Broadway Park," as the development is expected to be called, will draw on the historic heritage of the site and unlock substantial public access to a section of Ann Arbor's southern riverfront. More than 80 percent of the site – approximately nine acres – will be developed into open space and green infrastructure, with about 1,200 feet of restored Huron River shoreline. The development also is expected to include an 8,000-square-foot year-round event pavilion, up to 100 residential condominiums, a boutique select hotel and up to 20,000 square feet of retail space, including space for an attractive, high-quality restaurant facing the Huron River. 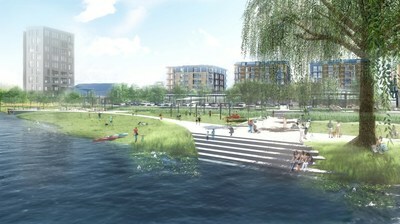 "Our development agreement with Roxbury Group is the result of DTE Energy's commitment to developing this site in a way that highlights the natural beauty of the riverfront while preserving much of the land for the public's enjoyment," said Gerry Anderson, DTE Energy chairman and chief executive officer. "Broadway Park is designed to be an iconic development and public space that further solidifies Ann Arbor's reputation as one of the state's premier communities." "We are thrilled to be working with DTE Energy to unlock the incredible potential of this unique site," said David Di Rita, principal of The Roxbury Group. "Given our group's strong ties to Ann Arbor, we understand how impactful this project will be to the community, and we are pleased and honored to have assembled such an impressive team to bring Broadway Park to fruition." "We are excited that, in addition to the residential and commercial development, Broadway Park will provide residents with an activated public space connecting to the surrounding parks and trails along the Huron River. We believe the Broadway Park public space will be a significant benefit to Ann Arbor, as it will be located facing the Huron River, across from the Argo Cascade white water feature," said Howard Lazarus, Ann Arbor City Administrator. The Roxbury Group is Detroit-based real estate development and investment firm founded in 2005. The firm specializes in complex real estate and economic development projects. The company was founded by University of Michigan graduates Stacy L. Fox and David Di Rita. Since its founding, the Roxbury Group has developed projects for its own account and others totaling over $125 million in total project value with $75 million of projects in the pipeline. In 2014 they re-opened the historic David Whitney Building in downtown's Grand Circus Park, following a $94 million redevelopment into an Aloft hotel and 105 apartments with first floor restaurants and retail, and completed the award-winning Outdoor Adventure Center on Detroit's riverfront in partnership with the Michigan Department of Natural Resources. Most recently, they opened The Griswold, a $24 million, 80-unit apartment building that will rise five stories atop a 10-story parking and retail building in Detroit's Capitol Park, and the Plaza, a 74-unit apartment conversion of an historic former office building in Detroit's midtown district, and are nearing completion of the redevelopment of Detroit's long-dormant Metropolitan Building, which when completed will house an Element Hotel by Westin as well as first floor retail.